2004 Topps Wacky Package Original Sticker Card Art! 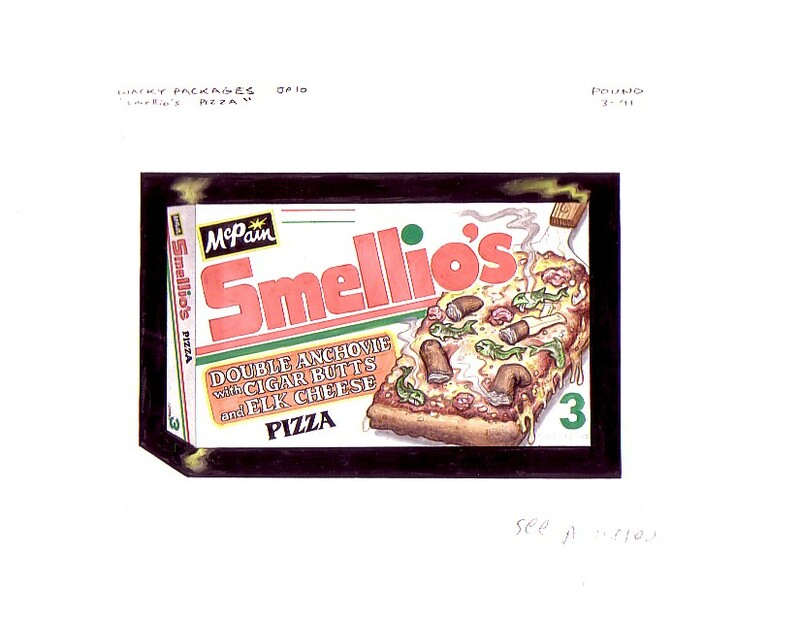 Smellio's. This exclusive ebay auction features a one-of-a-kind original painting used in the process of creating this 2004 Topps Wacky Packages parody sticker. Topps commissioned artist John Pound to create this colorful parody of the Ellio's froxen pizza package. Art board measures 8 1/2 X 11" in size and is in excellent condition. Highly-collectible, this highly-detailed artwork will look simply stunning matted and framed. Original painting is signed and dated by the artist. One of the BEST!!! All Topps Vault auction lots come with a certificate of authenticity. Collectors, please visit our other special Wacky Packages auctions on ebay today!!! PAYMENTS All payments must be received within 14 days of the auction ending date or you will forfeit winning bid. The following forms of payment are accepted: Personal Check, Cashier's Check, Money Order and PayPal. Items will not be shipped until the total price, including shipping fees and sales tax has been paid in full. All checks should be made payable to Topps Vault, Inc. Please mail to The Topps Vault, The Topps Company, Inc., One Whitehall Street, New York, NY 10004. SHIPPING POLICY The Topps Vault invoices daily. Only those items won on the same day can be merged onto one invoice. All shipping, sales tax and insurance charges are applied per invoice, not per auction. All packages are shipped via UPS Ground. Value of Package: Over $499 Shipping Charge $12 . All orders over $100 must be insured . The UPS charge is 35 cents per $100 of insurance coverage purchased after the first $100. The first $100 of value is insured at no charge. For residents of AK and HI, additional shipping charges will apply. Canadian and other International customers will be responsible for shipping and all applicable duties and taxes. All Canadian orders are shipped vis UPS. Please note that UPS will charge a brokerage fee in addition to standard UPS charges. .
Due to shipping restrictions we can deliver to street addresses only: No P.O. Boxes or FPO/APO addresses. Most orders will be processed within 72 hours after receipt of valid payment. All personal checks must clear before order is shipped. Orders are processed Mon. through Fri., 8-5 ET. Estimated UPS ground delivery time is 3-7 business days. TERMS AND CONDITIONS All sales are final. Because Topps Vault items vary in age and physical condition, all Vault items are sold "as is" and may not be returned or exchanged at any time for any reason. Please email Topps Vault with any questions before bidding. SALES TAX Items sold by The Topps Vault Inc. and shipped to the following destinations are subject to sales tax.